Moving Water Industries provides high volume commercial pumps for sale and rental to customers all around the world. When it comes to renting or purchasing a high-efficiency water pump, we understand that you may have many questions before you make your final decision. We have created a helpful list of frequently asked questions to help you better understand our commercial pumps, their common applications, our professional services, and our company, Moving Water Industries. If you don’t find your questions answered in the list, don’t hesitate to contact us. Our knowledgeable representatives and engineers are available to provide the information you need. Give us a call or fill out our convenient form for a fast response from one of our specialists. What are the minimum specs for the engine/drive units of your water pumps? Diesel and/or Electric Engines. Duel set ups are possible. Main suppliers are John Deere and Caterpillar. Our pumps are developed to work on jobs for contractors and engineers. MWI’s Rental Division can be more lenient on the requirements, but we still mainly only do work with contractors and engineers. Contact any of our Rental Locations for more details. What is an Axial Flow Pump? An axial-flow pump, or AFP, is a common type of pump that essentially consists of a impeller in a pipe operating in a casing. 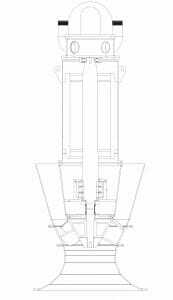 The pressure in the casing is developed by the flow of liquid over the blades of the impeller. The fluid is pushed in a direction parallel to the shaft of the impeller in course of their flow through the pump, do not change their radial locations. It allows the fluid to enter the impeller axially and discharge the fluid nearly axially. The propeller of an AFP is driven by a motor. The impeller operates by a sealed motor in the pipe or by electric motor or petrol/diesel engines mounted to the pipe from the outside or by a right-angle drive shaft that pierces the pipe. Fluid particles, in course of their flow through the pump, do not change their radial locations since the change in radius at the entry (called ‘suction’) and the exit (called ‘discharge’) of the pump is very small. Hence the name “axial” pump. In an axial flow pump, blades have an airfoil section over which the fluid flows and pressure is developed. What is a Mixed Flow Pump? 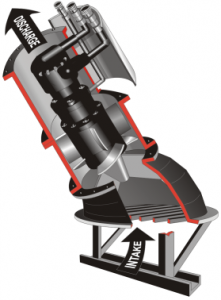 Mixed-flow pumps function as a compromise between radial and axial-flow pumps. The fluid experiences both radial acceleration and lift and exits the impeller somewhere between 0 and 90 degrees from the axial direction. As a consequence mixed-flow pumps operate at higher pressures than axial-flow pumps while delivering higher discharges than radial-flow pumps. The exit angle of the flow dictates the pressure head-discharge characteristic in relation to radial and mixed-flow. Do I need to own an MWI product to use the Repair Service? No, you do not need to own any MWI product for access to our repair service. Our repair service is available 24/7. We will gladly work with you on any type of industrial water pump at any size, no matter the brand. MWI knows how frustrating it can be to deal with malfunctioning equipment, so contact us as soon as possible for a diagnosis. Contact us now or call our Emergency Pump Repair line in Vero Beach for immediate support: (772) 770-0004. What specs does MWI need and/or are required to know when recommending a product or giving a quote? For fuel consumption, the known flow (GPM) and TDH(total dynamic head) are required. Which water pumps are available for rent and for which applications are they used? Currently, the Hydraflo™, DuraFlo™, RotoFlo™, PrimeRite™, Silent Partner™, and HNC water pumps are available for rent. Our rental products are available from 4″ discharge pipes to 12″discharge pipes. The Hydraflo™ can go up to 30″. The Hydraflo™ is our most versatile and demanded product, able to be used in nearly all water applications due to it’s unique design, easy installation, cost savings, multiple configurations, and uninstall process. DuraFlo™ and PrimeRite™ are best used for pumping in harsh environments where the water is thick and is filled with all sorts of materials, such as mud, sludge, garbage, minerals, etc. RotoFlo™ is best suited for wellpoint dewatering at construction sites or anywhere with groundwater close to the land surface. The Silent Partner™ is able to house all previously mentioned water pumps inside it’s silence enclosure. The sound amplified by the water pump, decibels(dB), is lowered by 33% inside the Silent Partner™, making it the perfect unit to use in areas where minimal noise is required, such as near hospitals, schools, libraries, churches, etc. Due to this product being an enclosure, the maximum discharge pipe available is 12″. HNC, Hydraulic Non Clog, is a durable, versatile, and cost effective hydraulic submersible pump. The HNC can be used for multiple applications and uses less power to operate compared to similar pumps. We recommend the HNC for sewer bypass and water transfer applications. All rental products are available on skids or portable trailers. For more information on our service and products, view our Rental and products page. If you are interested in renting our products now, fill out our rental form, contact a rep, or contact us directly to get started. MWI stands for Moving Water Industries. We are an extension of a business started by the Eller family in 1926 in Deerfield Beach, Florida. Originally founded as a company engaged in the manufacture of iron and steel equipment, MWI realized the need for a reliable manufacturer of pumping stations for irrigation, drainage and flood control applications around the state of Florida. Today, MWI is a frontrunner in the water pump industry and is one of the first companies called for their products and service for construction and industrial purposes. How powerful are the engines of your water pumps? The power of the engine depends on your specs and the application the water pump will be used for. All the pumps we manufacture are quoted with net horse-power requirements. Engine manufacturer’s curve reflect gross horse-power. There is a 15% difference due to the fan of the fly wheel. One gallon per hour for each 20 horse power. De-rate a naturally aspirated engine BHP by 3% per 1000′ elevation and de-rate a turbo-charged engine by 1% per 1000′ elevation over 4000′. Keep engine torque curves to the right hand side of the curve. Which graded oil is used to operate and lubricate your products? For hydraulics, we approve of any IS0 68 ashless hydraulic oil. We recommend purchasing ashless oil manufactured by Texaco or Exxon/Mobil. You should be able to find the recommended oil at the nearest department store or gas station. If you are unable to find the correct oil, contact us and we will be glad to assist.